My church planting coach was sharing with me last week that Mother’s Day is one of the most difficult Sundays of the year for him to juggle as a pastor. At the same time that we rejoice in celebrating moms, there are so many other emotions that come with Mother’s Day. There are those who wish to be moms. Those who wish they weren’t moms. Those who have recently miscarried. Those who haven’t been able to get pregnant. Those who have given up children for adoption. And a category I can fit into this year, those who have lost their moms over the past year. I don’t (so far) see Mother’s Day as particularly tough, personally. It wasn’t a huge day for us. We were rarely together, and I’d send a card or something. Not like Christmas, which was real tough because of how much she loved the holiday. But it does bring my mom and the past year to the forefront of my mind. It is another opportunity to remember her. To honor her, even in death. And to recognize one of the greatest gifts she gave us on the way out. I shared in my first post about her passing that I was reading Life of the Beloved by Henri Nouwen on the airplane as I went to San Diego that day. One of the things he talks about toward the end of the book is the opportunity we have to be “given” by God, of being a gift even in our deaths. The deaths of those whom we love and who love us open up the possibility of a new, more radical communion, a new intimacy, a new belonging to each other. If love is, indeed, stronger than death, then death has the potential to deepen and strengthen the bonds of love. It was only after Jesus had left his disciples that they were able to grasp what he truly meant to them. But isn’t that true for all who die in love? We often say we don’t know what we have until it’s gone. In some ways it’s true. This Mother’s Day I can look back on the life of my mom and be so thankful that God blessed me with her, and to continue to grasp what she truly meant to me. But in addition, perhaps one of the greatest gift my mom left us, as she died in love, was the relationships we now have with each other in our family. I’ve seen far too many examples of relationships torn apart by the death of a family member. But it has been a blessing to see it draw the rest of our family closer together than we ever have been before. This is especially true in my life with my sister and my aunt, two other amazing moms to be honored today. 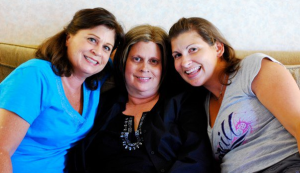 Even in the final days of my mom’s life I watched as my aunt and my sister supported each other, loved each other, and I watched the relationship between all three of them grow deeper in the last few months of my mom’s life. So today I’m gonna kick back at home and spoil my wife for the amazing mother that she is. And I also write this post as a way of remembering my own mom and expressing my gratitude for who she was and how she continues to bless our lives, even after moving on from this one. Love and miss ya mom. This post was great! Unfortunately, a candidates religion is one of the most important factors for me in deciding who to vote for. And it's becuase of so many of the facts you have mentioned. My son will not say the entire pledge of alligence – we don't belive in God – hence 'one nation under God'. He also doesn't say 'and justice for all' because he doesn't believe there IS justice for all. I think it takes a very intelligent and morally/ethical person to be a leader of our country and keep his religion separate from how he leads. Thanks y’all. Not gonna lie, it was a little tougher than I expected at times, but for the most part just enjoyed lovin on my wife. Love this. Thanks for the reminder that this day is bittersweet for so many. Thinking about you as you plow through many “firsts” without her. Thanks for posting. Been thinking about her lots. This is a great day to remember and honor her. She was a great mother and grandma. Thank you Bobby for such a wonderful new insight on death! You always have a way of reaching my heart through your words!!! You have blessed my life. That was beautiful, Bobby. Thank you.